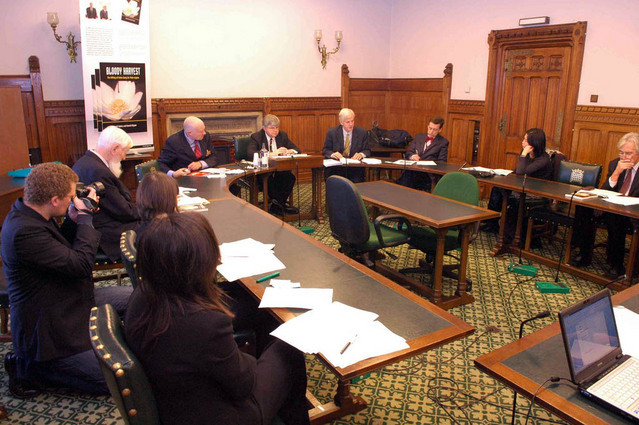 December 10, 2009 was World Human Rights Day, and a seminar on human rights in China was held in the UK Houses of Parliament. The Chinese Communist regime's harvesting of organs from living Falun Gong practitioners – a crime against humanity – was the focal point of this seminar. Member of Parliament David Howarth presided over the seminar, and former Canadian Secretary of State for the Asia-Pacific region David Kilgour attended the seminar by invitation. He introduced the new book Bloody Harvest he jointly wrote with renowned Canadian human rights lawyer David Matas. The book listed fifty-two forms of evidence they gathered during their independent investigation into the Chinese Communist regime's organ harvesting from living Falun Gong practitioners. The organs are used by the regime in the organ transplant trade for lucrative profits. The author of Losing the New China, Ethan Gutmann, also described in the seminar his progress in investigating the Chinese Communist regime's organ harvesting from living Falun Gong practitioners. 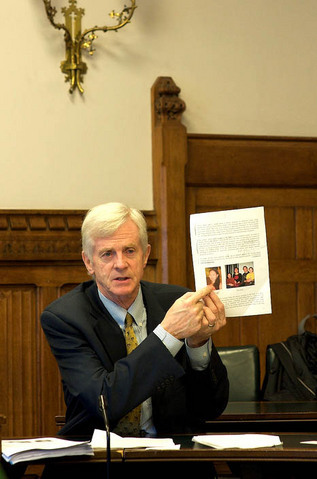 House of Lords members Lord Hylton, Lord Cobbold and other political figures, as well as representatives from Amnesty International, the Tibetan community and a Uighur group attended the seminar. Mr. David Kilgour said that Falun Gong practitioners are absolutely non-violent. Large numbers of Falun Gong practitioners were tortured after they were arrested by the Chinese Communist regime. If the practitioners still refused to recant (giving up their belief) after torture, they disappeared into the detention and forced labour system. Many of them were killed by the regime and their organs were taken for organ transplants. These organs were then sold to foreigners who went to China for organ transplants. When the number of foreigners going to China for organ transplants declined, the organs from practitioners were sold to rich Chinese people for organ transplants. "Only Falun Gong practitioners in work camps and prisons are systematically blood tested and physically examined. This testing cannot be motivated by concerns over the health of practitioners, because they are also systematically tortured. Testing is necessary for organ transplants because of the need for blood type compatibility between the organ source and the recipient." Kilgour said, "Falun Gong practitioner Crystal Chen spent three years in a camp and was medically tested about seven times, including two blood examinations." Mr. Kilgour said, "We estimate that about 41,500 organs transplanted over the period of persecution up to 2005 came from Falun Gong practitioners. How we reached this conclusion is explained in our book and also in our report. We deducted from the 90,000 transplants a government spokesman said were done over the period and examined those which came from executed criminals and other explained sources. The difference was a dismaying 41,500. Consider how much money the party-state and its agents are making from organ sales and forced labour provided by Falun Gong practitioners." He also cited an example: a person who went to China for an organ transplant in 2003 told them that within two weeks he was admitted into the First People's Hospital in Shanghai. The hospital carried out his blood matching test and other tests with four kidneys. Because of his body's immune response, none of the kidneys matched and all four kidneys were taken away. He returned to his own country. Two months later, he returned to this hospital. Another four kidneys were brought to the hospital for the matching tests. When the eighth kidney proved a match, the organ transplant operation was carried out. Ethan Gutmann said in the seminar that he interviewed Falun Gong practitioners in Bangkok who had escaped from China. During their detention, they were called out from the prison cells and transported to the hospitals for physical examinations. The doctors who carried out their physical checks were all military doctors. Gutmann said that according to his own investigation, about 72,000 Falun Gong practitioners were executed for their organs. In the seminar, an ethnic Uighur gentleman, Enver Tohti, said in his speech that he is a surgeon and works in a British hospital now. In 1995, he was working as a medical doctor in Mainland China. Early one morning when he was on duty, without knowing the situation, he was called by two other doctors to help out. They went to Xishan in Urumqi. After hearing a few gunshots, a policeman led them to the execution site and they carried off a man who was just executed. He saw that the man was still alive. The bullet was deliberately aimed so that he would not die within one or two hours. He said that in the ambulance, the doctors opened his chest and took out his liver and two kidneys. This nightmare has been disturbing him since. Thus he decided to speak out as evidence of China's organ harvesting. The results and cases of the investigations presented in the seminar shocked all participants and made people think deeply. The participants agreed that the human rights dialogues with the Chinese Communist regime have not achieved any meaningful results. Stronger measures should be taken. Some participants also said that the international community should take action now: "We don't want to be seen as only interested in commercial interest and abandoning human values." After the seminar, David Kilgour was interviewed by this reporter. He said that since the first day that he and Mr. Matas started their independent investigation, the Chinese Communist regime has been exerting pressure and putting up many obstructions. When the first investigative report was published, the Chinese Communist regime's public response was to point out that the report misplaced the provinces of two cities. Aside from this, with regards to the report's substantive and important sections, the regime didn't have any rebuttal. Even after the second investigative report and the new book Bloody Harvest were published, the regime didn't have any rebuttal to the substantive part. The new book contains 52 forms of evidence gathered during their investigation, proving that the Chinese Communist regime harvested organs from a massive number of Falun Gong practitioners and killed them recklessly. When the reporter asked Mr. Kilgour what drove him and Mr. Matas to travel around the world and tell people about the inhuman organ harvesting still going on in China, Mr. Kilgour said that he made contact with many Falun Gong practitioners during their investigation. He also met Falun Gong practitioners in other countries. He felt that Falun Gong practitioners are a very peaceful group of people, a very good group of people. Because of their belief in Truthfulness-Compassion-Forbearance, they are being murdered by the Chinese Communist regime. This is something that can't be tolerated in the 21st century. He also said: "Perhaps you may know that Mr. Matas is also a scholar studying the history of the Nazis' murdering of the Jews. The terrible lesson of the massacre teaches people not to ignore such anti-human atrocities as organ harvesting. I respect the Chinese people very much. Like other people around the world, they should also have human rights. They should be respected and treated kindly by their own government."